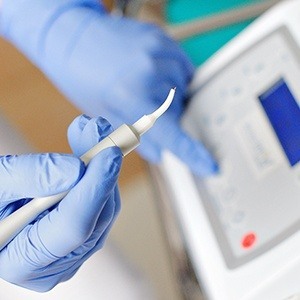 At Andover Family Dental, our dentists make every effort to stay up-to-date with new technological advances and techniques in the oral healthcare world. Why? Because these state-of-the-art touches benefit the patient experience in big ways, helping to make care more comfortable, efficient, and precise! Keep reading below to learn more about the tools we use on a regular basis, or contact us today if you’d like to schedule a first appointment. Intraoral cameras provide invaluable education when it comes to showing patients what’s really going on inside their mouth. A team member will navigate the camera-tipped wand around the teeth and gum tissue, capturing a series of highly detailed images that are transferred to our computer system immediately. Later, when reviewing findings from exams or possible treatment recommendations, our dentists can pull up these very same images on a monitor in the operatory as a helpful visual aid. There is a lot of valuable information about a person’s oral health that can’t be gleaned from just the surfaces of teeth and gum tissue. 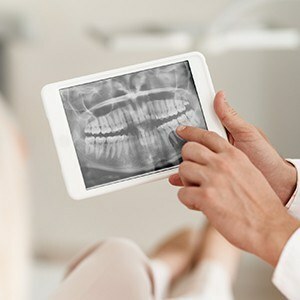 That’s why X-rays are a vital part of the diagnostic process, and Andover Family Dental now uses digital radiography as a much-improved alternative over traditional film. While the old version required hours of tedious darkroom development, digital X-rays can be viewed within seconds after their initial capture and can be modified as well through magnification and color-coding to improve patient understanding. They also exposure patients to dramatically less radiation, making them much safer. Impressions are an important step of many common dental procedures, including crowns, bridges, dentures, nightguards, veneers, and more. An accurate model of the patient’s teeth or overall bite is needed to create successful, long-lasting results – but unfortunately, the traditional method of using uncomfortable “putty” has several downsides to it. Thankfully, our Andover team has chosen to invest in digital impression technology instead! 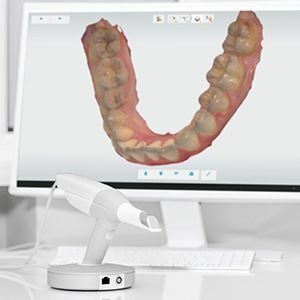 Now, we can create a comprehensive, three-dimensional model of the necessary teeth with just a few, no-contact scans of the mouth – no gagging required! When treating the soft gum tissue, our dentists want to be as precise as possible while also helping patients feel relaxed. That’s where laser dentistry comes in! This modern beam offers several significant advantages over traditional scalpels and sutures. For instance, soft tissue lasers minimize common post-operative symptoms like bleeding and swelling and greatly accelerate the healing process as well. Most people don’t even need local anesthesia throughout the procedure because of how minimally invasive it is. Our dentists regularly use soft tissue lasers when treating gum disease and aesthetically recontouring the gum line for cosmetic purposes.